Your purchase of Media Planning and Buying in the 21st Century even includes on-line Reach & Frequency Software! The world of advertising media planning & buying is transformed. Facebook, Twitter, YouTube, print, television and every shiny new communication technology all now have roles in media planning and buying. Ronald Geskey's comprehensive new media textbook is an encyclopedia of 21st century strategic media planning and buying know-how. 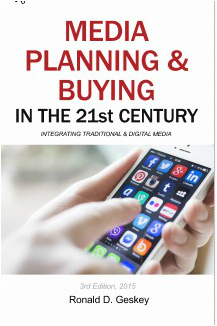 "Media Planning & Buying in the 21st Century" has something new to teach all media students, in and out of college, including seasoned media professionals. No one who aspires to achieving superior media effectiveness can do without this media textbook. This all new, third edition advertising media planning and buying book includes over 550 pages of easy to understand information gleaned from the authors 30+ years experience at some of America's leading advertising agencies and universities. A fantastic reference for business people, up and coming media professionals and media representatives, after using the book, workbook and free reach and frequency software, you will "speak" advertising media planning like a seasoned veteran. Advertising in the media? Traditional media? Digital media? Social media marketing? It is probably not news to you that we are in the midst of a marketing and media revolution. But are you leveraging the elements of the revolution into greater ROI? How much greater could your ROI from Advertising be-- if it was optimized for the trends and events of the 21st century? This new advertising media planning book, will lead you step by step through the process of the traditional and digital media planning and buying. At $79.95, this advertising media planning and buying book is a great desk reference for media practitioners and managers. To complete a package, also available are a companion workbook and the 2014 Thumbnail Media Planner. "A business book always starts with an Author who knows what he's talking about." With over 30 years of experience and cumulative responsibility for billions of dollars in ad spend -- as a media director at major advertising agencies like Leo Burnett, D'Arcy, and Campbell Ewald (Chevrolet), and General Motors R*Works-- Ronald D Geskey, Sr. has written the most comprehensive, up to date, and easy to read media book currently available.